This coming week, a chapter is closing on our lives at this end, and I plan on this being the final prayer mail related to our mission work. Of course, we could always use your prayers in the times ahead as you happen to think of us. 1) This is planned as my last weekly distance learning update before my attention will be focused in other ministry directions, with a few exceptions. Aside from individualized emails, for any future distance learning updates please look to the announcement section of the distance learning Web site. 1a) As one of my remaining connections, I am currently revising the Christian Doctrine/Christian Theology course to be a Christian Doctrine/Christian Theology course with an Anglican perspective, instead of an additional course focusing specifically on Anglican Doctrine/Anglican Theology. It may be finished in a few weeks. 1b) When I have finished that project, another of my remaining connections that I am planning will be to work with the Main Administrator to turn the current notes and slides from the individual courses into Kindle-based documents that can be downloaded from the Internet. 2) One of our students is nearing the very end of the final course in the program. 3) These courses will be open for the rest of 2016. Beginning in 2017, I plan to be the Benefactor of the course Web site, to keep it open for all of 2017 and for as much as I can beyond, but I won’t know for sure how this will work until January 2017. This has been a full week in other aspects of ministry and in family life as well. 1) For guidance on the path ahead are appreciated, including a smooth transition, and also for people in Belize in the wake of my departure. 2) For the transition of the Diocese of Belize Web site to the creation of a new one in due course. 3) For the publication of the Spanish Prayer Book, scheduled for this month, but I have not heard anything about it. 4) For the parishes and other matters that we are involved with. Julie continues as a hospital chaplain. I continue as an Interim Rector. Lydia continues as a student. And mission work? As you can see from the above, there is a small bit to do yet. In the near term, Julie and I both continue as Associate Missionaries with SAMS, probably for as long as we have a missionary connection of some sort with Belize, unless something changes. My prayer for you, this week, is that you would be open to what the Holy Spirit is guiding you to do and say. This is our prayer mail for Monday, 19 September 2016. This is our penultimate prayermail/update. Next week will be our final week. This week has been another full week. Regarding the distance learning program with Belize, I have arranged for the program to continue via a Main Administrator for technical matters, a Course Design Director, and a Dean of the Faculty (coordinator of the faculty). I plan to continue in the roll of Benefactor for the time being, and continue as Director of the diocesan seminary until my replacement is named. One of the upcoming projects to be undertaken by the Course Design Director is a confirmation curriculum for the diocese, all things being the same. The future Course Design Director completed a course this week, would complete the entire curriculum at the end of the current and final course that the person is taking. I plan my handoff of the remaining parts of the program to take place when this person has finished the final course, and soon. That means: some information will be passed along, some training to go, my being available for questions, and so forth. I also made a recommendation for someone interested in Holy Orders (diaconate). This week in hindsight: phenomenal, and answered prayers for actually potentially expanding the program. To paraphrase what someone has said: I enabled the program to take off, and now it has wings. The timing was good for doing this. It was a full week in other aspects of ministry and in family life as well. 1) Prayers for guidance on the path ahead are still appreciated, including a smooth transition, and also for people in Belize in the wake of my departure. 2) For the transition of the Diocese of Belize Web site to the creation of a new one. 3) For the publication of the Spanish Prayer Book, most likely this month. I continue to pray for you, every day. Fr. Shaw, and on behalf of Rev. Julie. Mudge Making a Difference Newsletter. September 2016. On October 1st, both Julie and I will have become Associate Missionaries with SAMS. This is to say that after 7 years of mission work, neither of us will be employee missionaries of SAMS. 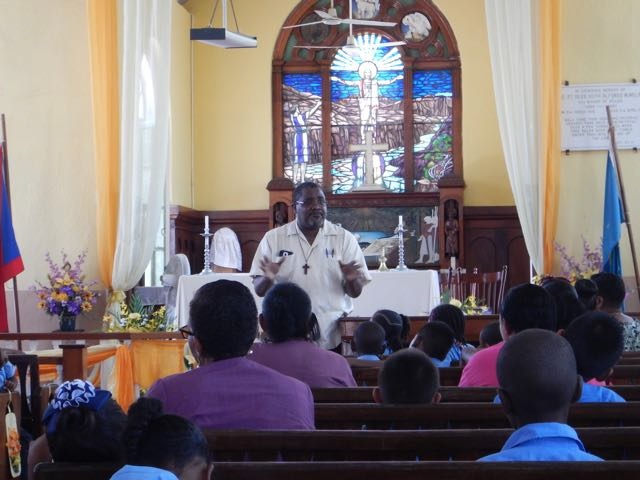 1) From the U.S., I may still be involved with Belizean long distance learning ministry in some way. 2) The diocesan office in Belize may need my as- sistance briefly from the U.S., to move items from the current diocesan Web site that I designed, to a new one. Our mission work has been built upon an extensive foundation of our previous work and experiences. Looking ahead, our mission work provides a founda- tion upon which our future endeavors will be based. Because of your continued prayers and financial support, you have made it possible for us to do what we have done. So, thank you for having enabled us to do what Jesus has called us to do, by supporting us through SAMS. We and SAMS could not have done what we have accomplished without you. Best wishes, and God bless you. Fr. Shaw, and on behalf of Mtr. Julie and Lydia. all transform the future of the country, one moment at a time. Lately we have been asking you all to pray for discernment, yet not with any preconceived agenda in mind. At long last and in the past day or so, it has become really clear to Julie and myself that the way forward that God has in mind is for us to become Associate Missionaries with SAMS. Sometimes the answers are about timing. In terms of Belize et al, we are moving in new directions and away from missionary work (official change date is October 1st, and because there is a fair amount to do, please keep your financial support and prayer support coming our way through September). In addition, we are planning to continue as canonically resident clergy in the Diocese of Albany, and we plan to continue with our other avenues of ministry which started out simply as ways to supplement our mission work and which have developed a life of their own. 1) Prayer support would be appreciated as long as we keep the prayermails going. iii) my issuing a certificate for the student’s having completed the overall program. 2b) If the Bishop of Belize needs an officially designated person as Examining Chaplain and/or Director of ATI, I may need to keep my name there as a placeholder, so that there is some continuity, until he finds my replacement. Most of my work might be by email or Skype. He may want to be thinking about replacements in time for Diocesan Synod this year, in October. 2c) Shut down what I can of my temporary Diocese of Belize Web site as soon as I hear from the Diocesan Secretary that the new permanent site is set up. I have begun transitioning in that direction this past week. The Diocesan Secretary in Belize told me this week that at long last (since 2014) they finally have a way forward for a diocesan Web site. 2d) I might keep a title such as “Director of the ATI Distance Learning Program” until the Web site closes down, so that one of the students has a way forward. 2e) I may make a trip for the unveiling of the Spanish CPWI Prayer Book if there is one. The Prayer Book is scheduled to be printed in September. You have been very faithful supporters, both in prayer and financially. We can’t thank you enough. We have enjoyed your company since we began our odessy in 2008, through our adventures together in Peru, East Africa, and what God has had in mind for us in Belize. 4) We (all of us – you included) have made a tremendous difference wherever we have been. I plan to keep the prayermails and monthly newsletter up and going through September. 5) Each of you has been important to us. In particular, Torre got me started on this prayer mail idea. Jeanne has been faithful in getting the word out. Tom Gizara has been our advocate. Bill Schrull has been our faithful tech support person. And you have been faithful. The cast of helpers has been thousands more. And thousands of people have affected/will be affected by what we have been doing in one way or another, on at least three continents. 6) We have many friends because of our mission work. You are one of them. 7) I also appreciate all that my family has been through on our behalf through it all, especially Julie and Lydia, as well as the help that we have had from all our family members in their supporting roles. Next prayermail will be coming out next week. Now, we pray for the transition and what lies ahead. Best wishes, and may God bless you in your endeavors.